Improves on the design and effectiveness of the RF Pro to become the undisputed reflexion filter champion. Improved acoustic isolation. Larger, so can shield a wider range of instruments. Much better stand design. Very few to speak of. 'Industry standard' is a term too readily used within music production circles but, when sE Electronics' original 'Reflexion Filter' first became available eight years ago, it quickly shifted from 'the product which couldn't possibly work' to 'the product no studio can do without'. For the uninitiated, the Reflexion Filter promised to radically improve the sound of recordings made in studios of all shapes and sizes. It did this by offering an acoustic shield around the back of a microphone, absorbing and diffusing frequency content to produce cleaner, more acoustically-isolated recordings. Suddenly, pro, project and home studio recordings improved in quality and sE had a hit on its hands, which spawned a range of cheaper (and comparably less effective) sE models, not to mention a raft of clones from other manufacturers. Now, eight years on, a new model - SPACE - is here to provide sE's new flagship offering in this part of its product line. SPACE stands for 'Specialist Portable Acoustic Control Environment' and promises, first and foremost, even better acoustic control than the Reflexion Filter Pro, SE's previous 'top end' model. The design improvements include an additional layer of acoustic treatment; RF Pro's nine layers have become ten, but more significantly, each of the layers is bigger than before. To explain; inside SPACE, you'll find multiple layers of Wool Absorbers, Aluminium Foil Membrane and Polycarbonate Diffusors, and air gaps between outer layers of Bass Trap Pillars and Polyester Acoustic Fibreboard. Compared to RF Pro, each of these materials (and the air gap) has been increased in size and density of material, producing even more effective acoustic isolation. Additionally, the size of SPACE is considerably larger than RF Pro; it's roughly 20% wider and taller, whilst being 2-inches deeper, making it a much more substantial affair than its predecessor. You might be justified in wondering how this makes SPACE 'portable'; surely, this increased size and density comes at a substantial weight cost? Well, no. As aluminium has replaced steel as the primary manufacturing metal of choice, SPACE is almost exactly the same weight as RF Pro. The deeper air gaps and rear wall pillars are particularly noteworthy, as they've been designed to break up frequency content and randomise diffusion, improving the acoustic isolation of this design characteristic substantially over the original. Whilst producers and engineers alike were happy to laud RF Pro's results, they were markedly less happy with the design of the contraption which sE supplied to attach it to a microphone stand. With justification too; we think even sE would admit that the fragility of the design, when compared to the weight of the object it was designed to hold, needed an overhaul. So, it's with a huge sigh of relief that we can tell you that SPACE does indeed feature an updated system for attaching itself to a microphone stand, that it is much sturdier and that it's much simpler to put in place. It's closer in design to an angled drum kit bracket now and feels much more secure. 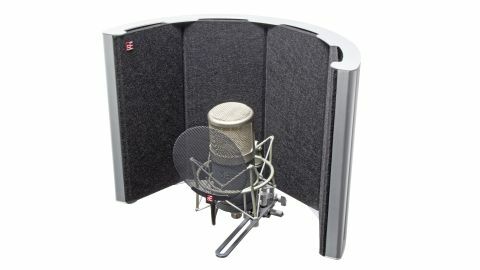 SPACE is a hit; we're big fans of the RF Pro, and count it as an essential studio tool for providing additional acoustic isolation around vocal and string recordings - but there's no doubt that SPACE does the job even better. On test recordings, we noticed cleaner results even less influenced by our studio's natural acoustic reflections, which made mixing them more immediately creative, with fewer 'corrective' EQ changes required. SPACE's increased size also makes it more effective around larger instruments; we tested it on a cello recording session and noticed a dramatic improvement over RF Pro. A number of imitation 'reflexion filters' have come to market since sE's original but very few actually do what they're supposed to, which is to improve acoustics around recordings. SPACE absolutely underlines sE's status as the market leader in this field.